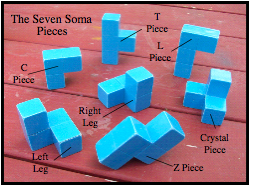 In an April 2009 post I introduced the seven Soma puzzle pieces that fit together to form a 3 x 3 x 3cube. The seven pieces and the names I’ve attached to the pieces are shown below. Two of the Soma pieces look alike but are actually left-right copies of each other. 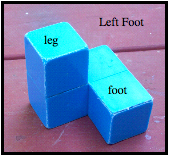 To differentiate between the two, I call one a left foot and the other a right foot. In a later post (June 2009) I described the time I was watching my grandson Asher stack the pieces and how it dawned on me that the seven Soma pieces are useful for exploring stable and unstable structures. Perhaps, to a child, the towers of the architect are more interesting than the cube of the mathematician. Grandmothermath and grandadscience recently visited our oldest son and his family in Ronquiéres, Belgium. Their two sons (two of our four grandsons) are John age four and Andrew age three. 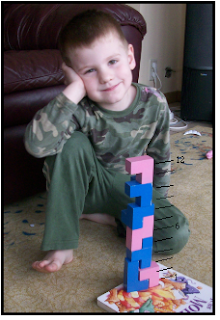 They love to build with Lincoln Logs and Lego and even find a set of dominoes useful for building fences. I had made and sent them a set of Soma pieces. For a couple of days they ignored the Lincoln Logs and Legos and focused on building towers with the Soma pieces. The only Soma piece that isn't vertically stable is the 'Z' piece (see above, first picture). 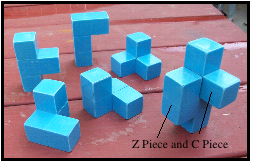 The 'Z' can be made stable by adding the 'C' piece as shown in the following picture. 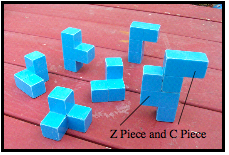 In fact, the 'C' piece can be placed in more than one configuration that stabilizes the 'Z' piece. Will any or all of the other 5 pieces stabilize the 'Z' piece? 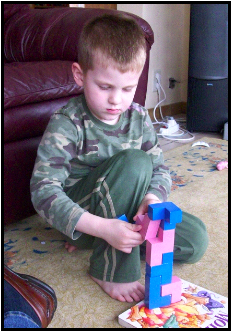 Here John has used the flat Soma pieces (C, L, T and Z) to build a tall structure but now has to deal with fitting the left-foot, right-foot, and crystal piece into the structure. With a little rearranging he finishes with all seven pieces forming a 12-story tower! As an educator I’ve witnessed the failed attempts to ‘give away’ self-esteem to kids. Gold stars, smiley faces, no red ink, etc. only fool adults, not kids. The satisfaction earned by solving a problem is all the reward John needs as is shown by the smile on his face in the previous picture. Andrew too built many towers but unfortunately grandadscience could not find the camera (misplacing things seems to happen a lot these days). In theory, what's the tallest tower that be built from the seven Soma pieces? Can this tower actually be built? I leave it as a question for you, your kids, or your grandkids to answer.